The Brandon Hotel - Fairfax Hall, Waynesboro, Va.
Fairfax Hall was opened on Thanksgiving Day, 1890, as the Brandon Hotel. It is a very long and rambling resort hotel building in the shingled mode of the Queen Anne Style. It was built as one of many “Railroad Hotels” in the Valley area and was one of many hotels in Waynesboro. By all accounts, it was the largest and grandest. Today, this building and one in Buena Vista (used for many years as the central building of Southern Seminary and now a Mormon Church centered college) survive as examples of the railroad era of hotels. It was built with many fireplaces and used natural gas for lighting. However, it was wired for the electricity that was soon to be available as electric lighting was on its way. Early photos show gas-lighting fixtures that had been converted to electricity. In advertisements, it boasted central heat. There was indoor plumbing, and the sewage went straight to the river! It was quite a building for its time and placement in Basic City, Virginia. Basic City Mining, Manufacturing, and Land Company was organized and designed so that Basic City would become the “little Pittsburgh” of the Shenandoah Valley. Due to the many boom and bust cycles that occurred in the late 1800s and early 1900s, Basic City never became the success that it was designed to become. Early Basic City/Waynesboro sported many industries including a pencil factory, furniture manufacturers, an automotive plant, vinegar plant, stove factory, and supporting industry for the railroad – which boasted a major intersection of north/south and east/west lines. 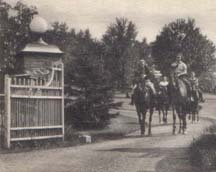 As a business hotel, the Brandon was an economic success for only a few years and quickly began marketing the healing qualities of the local springs, the peaceful setting, and the cooler summers in order to attract the tourist market. 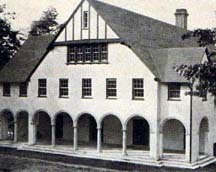 By the early 1900s, it was listed as a boarding house. In 1913, Elmer Hoenshel started a music school called the Brandon Institute. It operated marginally for several years. Early lobby photos show sparse furnishings. The Hoenshels built their home two blocks away in 1928 at 659 N. Winchester Avenue – with materials from Sears and Roebuck and named it Elra Oaks. It was restored in 1990.